The two axle Cityliners were followed by three-axle Cityliners that became the standard for many years. When the original Starliner was launched in the UK the model became the new choice for the fleet. Twelve were ordered in 1999. 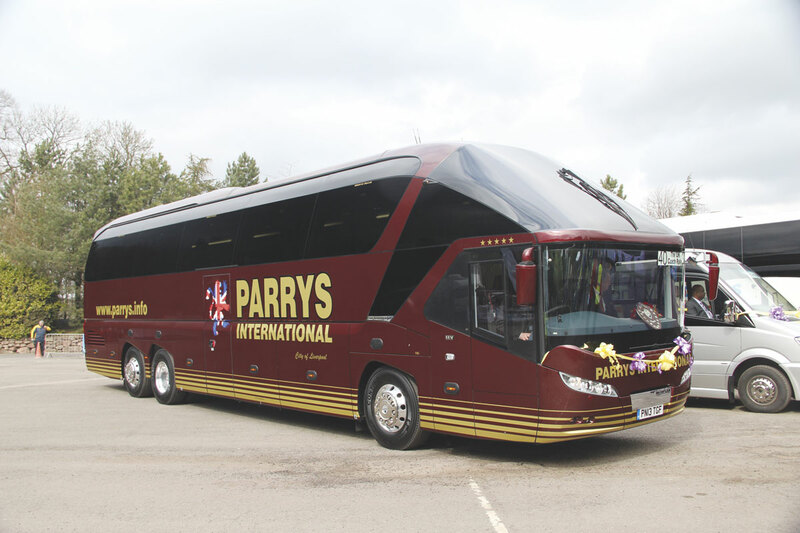 Parry’s continued to buy the Starliner 1 for as long as it was possible to do so, and by the time their final examples were delivered (including the very last one) the first left hand drive Starliner 2s were already operating. Dave had been aware of the development of the new model from the outset and had been shown the early mock ups at Stuttgart. 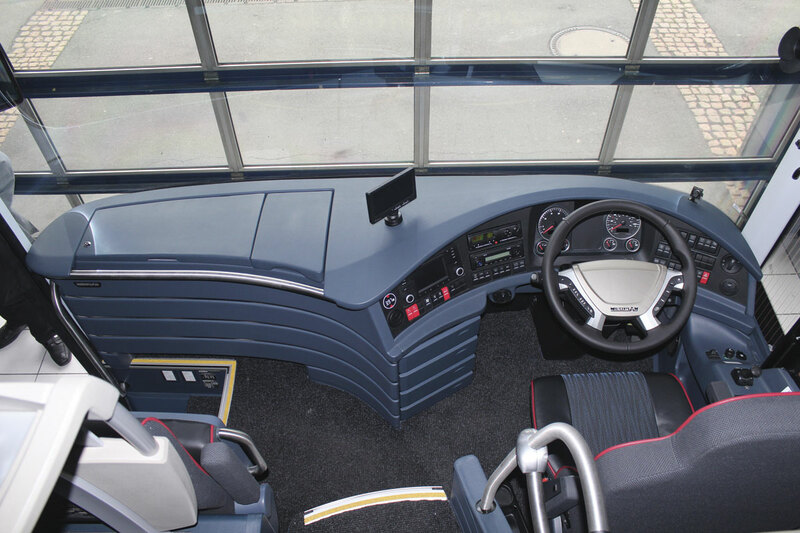 The intention was to switch to the Starliner 2 and a left hand drive demonstrator was shown at the company’s annual January brochure launch day in 2006, where it was announced as the coach Dave would be buying for future seasons. Unfortunately, the decision was subsequently taken not to offer the Starliner 2 in right hand drive at that time, despite Dave trying hard to persuade the company to build the model. 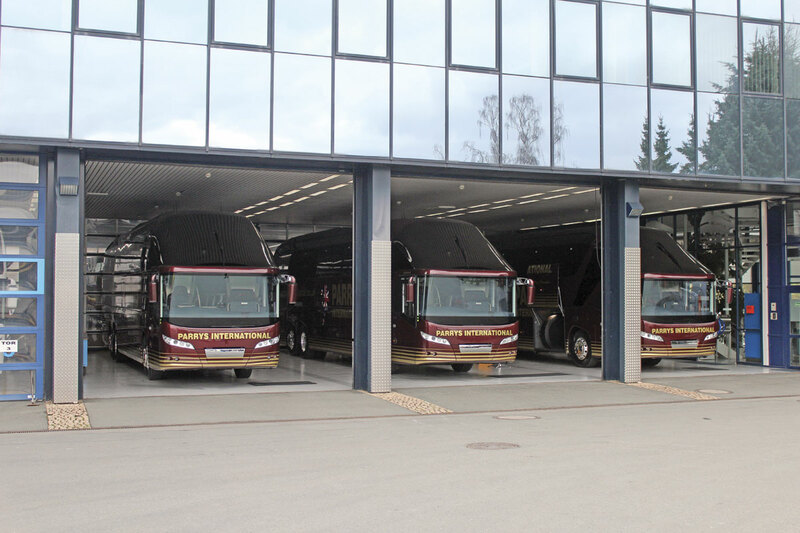 In the absence of a suitable top of the range option from Neoplan, in 2007 Dave switched his buying policy to Van Hool with from 2008 onward large numbers of Van Hool Acrons acquired. 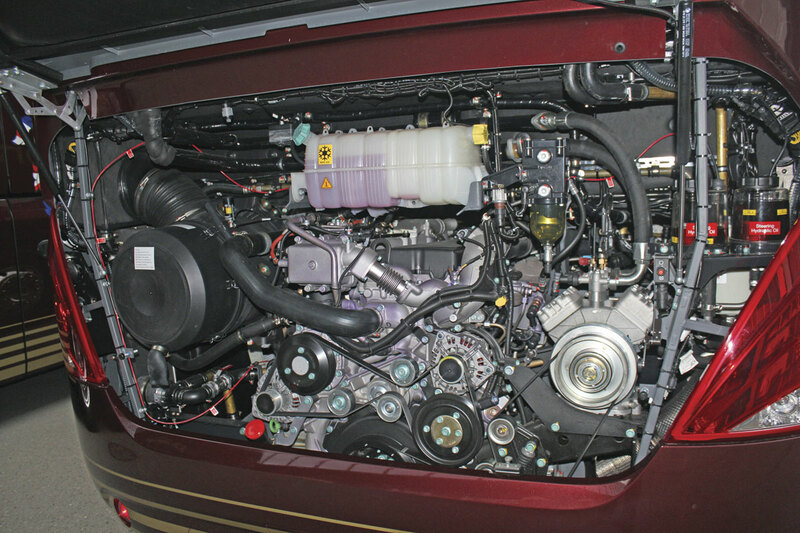 These featured MAN engines and proved good purchases. 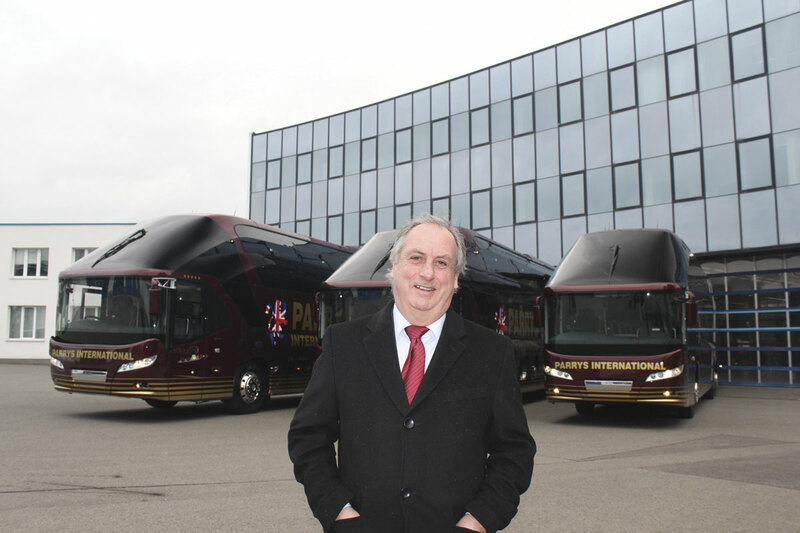 However, when MAN decided that it would after all offer the Starliner 2 model in right hand drive, Dave was persuaded to take a 13.99m long P12 model that went into service in 2013, winning the Coach of the Year title at the UK Coach Rally at Alton Towers. He likes the MAN engines too, having specified nothing else for his full sized vehicles since switching from Mercedes-Benz in the 1990s when they would not supply him with turbocharged engines. 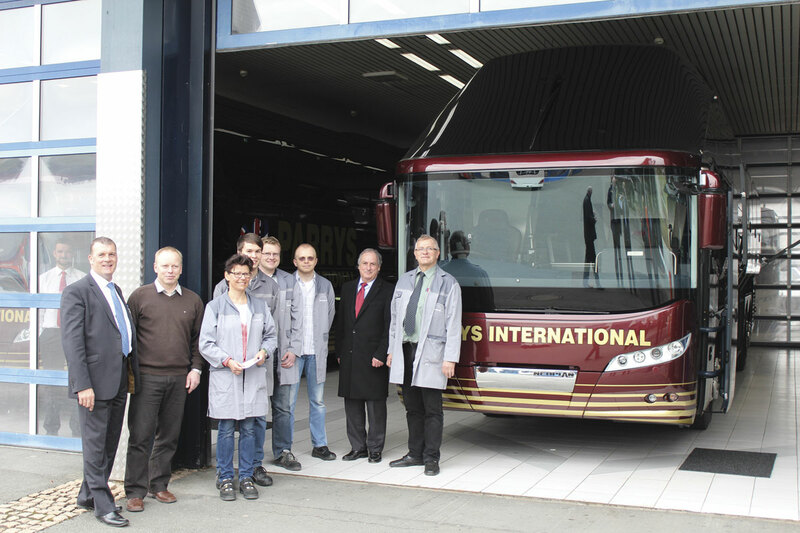 For this season he has purchased three more Starliner 2 P12s, as well as six more MAN powered Van Hool TX17 Astrons. 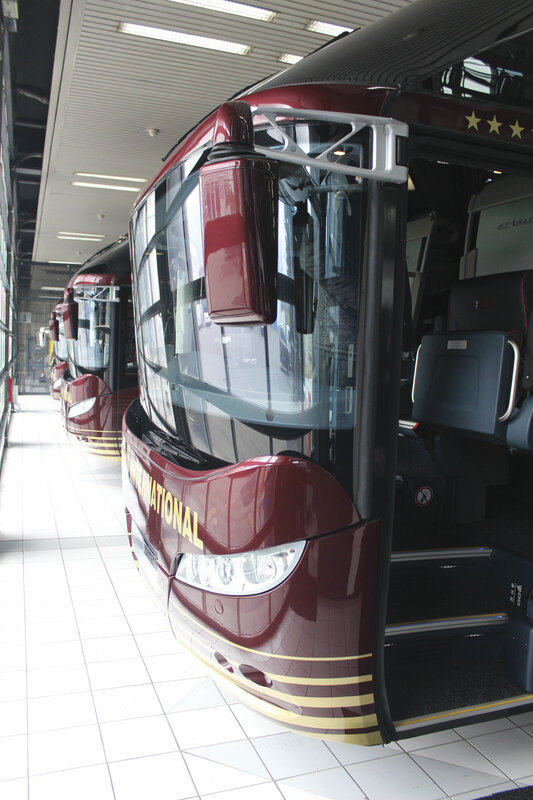 He generally runs a coach for no more than three seasons before it is replaced, the current main fleet of 11 being completed by the 2013 Starliner and a 2012 Astron. ‘We change regularly to stay ahead,’ he said. An early success for the company came in banning smoking on its vehicles in 1986. ‘A lot of people said we’re not going to travel with you any more, but more said we are going to travel with you,’ Dave recalled. The business undertook its first tours in 1981 when the market was deregulated, though it had previously been taken to court because it had been advertising trips to speedway away matches. It wasn’t long after deregulation that all other forms of work were abandoned to concentrate on the touring side. For the new Starliner trio Dave has gone for his most comprehensive specification yet: and he’s a man who knows more than most about high specifications. 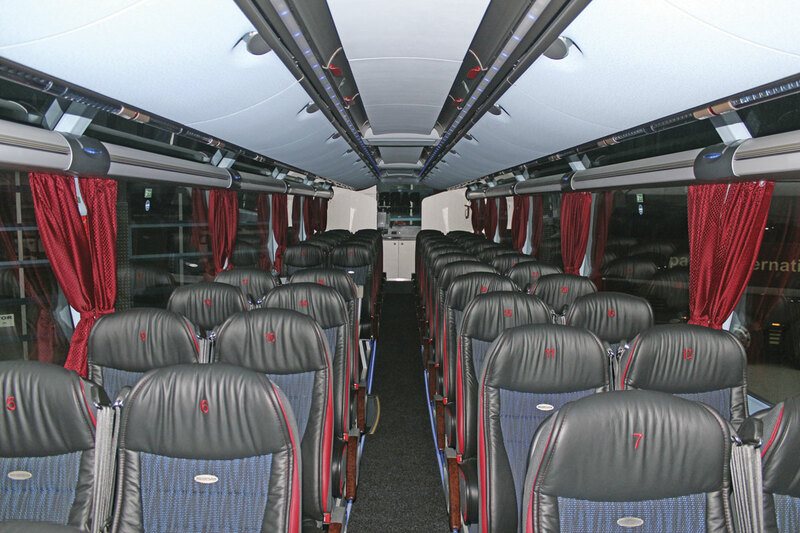 Every coach in the fleet now has 48 seats within 14m and a rear kitchen, the only exception being the 2013 Starliner which has a centre kitchen. ‘We’re into step lighting, lighting in all the grab handles, we have every safety thing we can think of,’ he said. 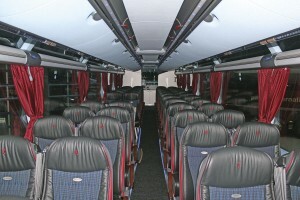 The seats are the Kiel Joker Plus. 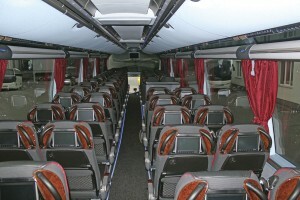 Within the rear of the headrests they have screens for the Funturo in coach entertainment system. 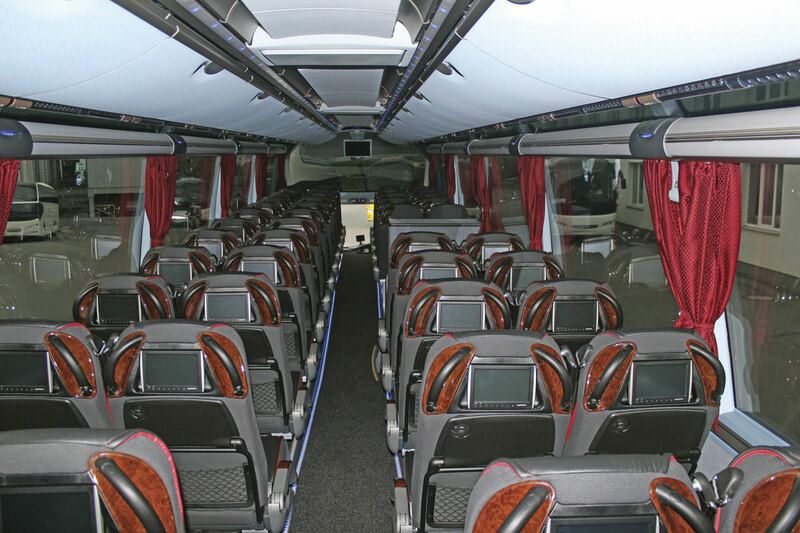 Dave explained, ‘all our coaches now have the Funturo entertainment system for use only on our long haul European work. It is supported by Autosound in the UK and we are going to manage the system ourselves. We give free headsets to everyone, giving them access to 100 movies, GPS, digital TV, front camera view, Tourist Board DVDs, games, information, our company history, a full music choice, extra safety information, radio, how to operate the system and promotions as well as background music. There’s enough to keep them busy for an 11 day tour. It’s the future.’ He pointed out that the three screens are still in place over the aisle. Dave claims to have been the first UK operator to introduce charging extra for the front seats, though he made them Pullman seats to justify it. He now charges £5, £10 or £15 extra per front seat, depending on the tour duration. He believes he was among the first to do an on-board magazine, though this has now gone on-line. One non standard feature he specifies is two sets of batteries rather than one, along with an auxiliary point to charge from an outside source. Like most of the specification it has been developed on the basis of experience, either to enhance the customer experience or to ensure ease of use and avoid operational problems. Luggage is always an issue when touring although the tri-axle Starliner and the reduced seating capacity leaves a considerable margin to play with. 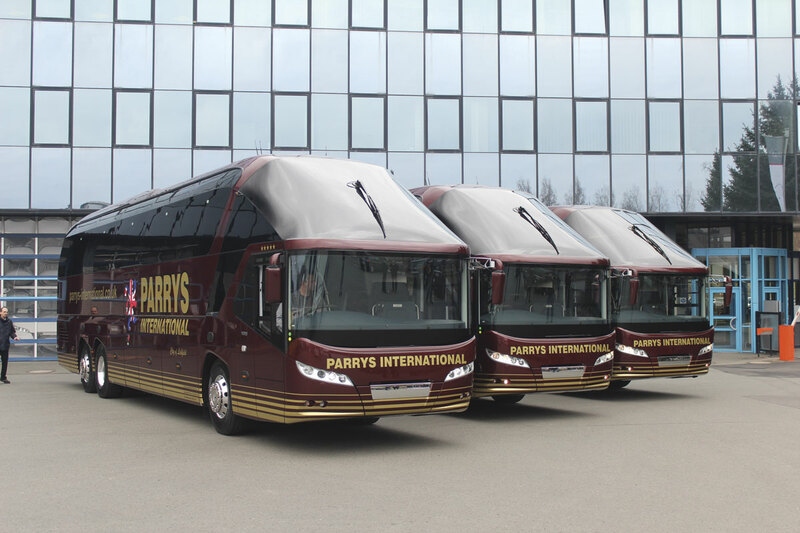 Parry’s approach is to set a limit of 18kg per person and equip each coach with scales that enable the driver to check. Within the booking conditions the right is reserved to charge extra if a case is overweight. Something Parry’s pioneered was the multi coloured ‘mood lighting’ system which enables the interior lights to be set to pre determined colours appropriate to the location or time of day. Alternatively, they can be gradually run through a series of colours. This was first introduced in 2009 in a product marketed as Diamond Class and is now standard. It was in Diamond Class that the idea of separate men’s and women’s toilets was tried, though this has not been perpetuated. 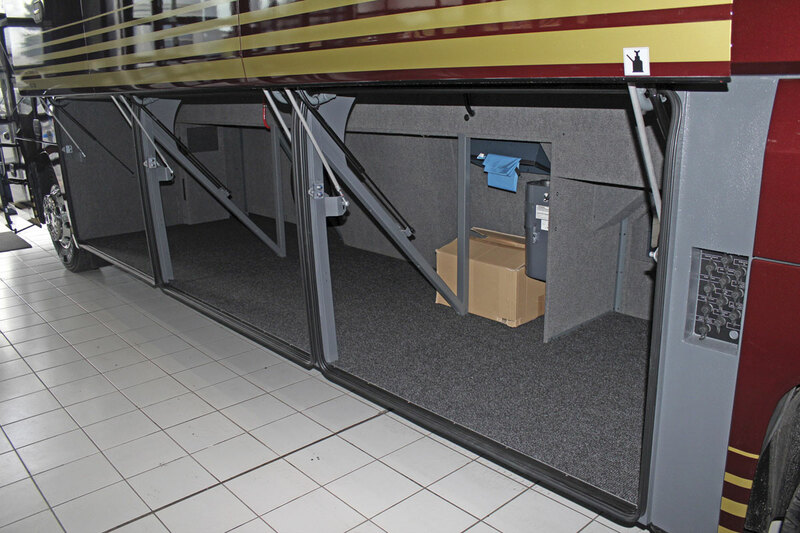 In specifying the interior of a Starliner, Dave Parry faces an issue that he does not face on other coaches, which is that whatever he wants has to coordinate with the blue that Neoplan use as standard on the racks and window pillars as well as other areas of the coach. He feels it would be easier to produce the effect he seeks if there was a grey alternative to the blue. His comments were noted by the Plauen team and I had the distinct impression that this will be an option in the future. 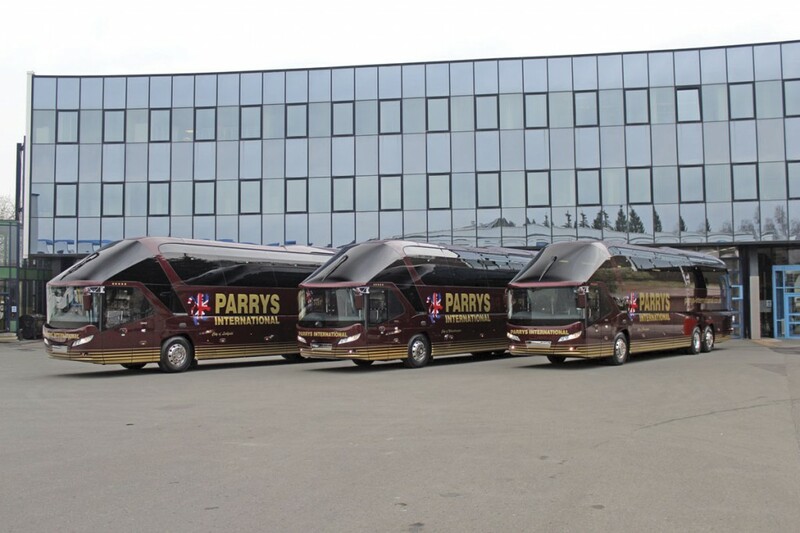 Parry’s trio of 14m Neoplan Starliner P12s illustrate this can-do attitude from the manufacturing team at Neoplan’s Plauen plant where the Starliner is built. Dave was impressed by the way that Product Manager, Dieter Paske, who had been at the initial meeting when the purchase was first discussed, had introduced him to the members of his team. He also noted the sense of pride in the workforce that a lot of people had come out to witness the handover take place.